Section 1. This committee shall be known as the “Fairfax County Democratic Committee”, referred to in these Bylaws as the “County Committee”. Section 2. These Bylaws are adopted by the County Committee under the auspices of the Democratic voters of Fairfax County and the authority of the Virginia Democratic Party Plan and shall continue in effect subject to amendment as elsewhere provided. The County Committee shall have full charge of the affairs of the Democratic Party in Fairfax County, including the nominating process for, and support of, Democratic candidates. If any provision of these Bylaws conflicts with a provision of the Virginia Democratic Party Plan, the Party Plan shall control. Section 3. It shall be the duty of the County Committee, as well as each officer and member thereof, to actively seek the registration of voters, to perfect the Democratic organization within the County, to encourage the expression of positions to elected officials on policy issues, and to do all within their power to aid in the victory of the Democratic Party’s nominees in all elections, except as otherwise provided in the Virginia Democratic Party Plan as it deals with nominees who support candidates opposed to a Democratic nominee. Section 1. As provided in Article III of these Bylaws, the membership of the County Committee shall expire and new members shall be elected at caucuses to be held on or between the first and second Saturday in December of each odd numbered year at a venue within each Supervisor District, the caucuses may be held on different days within the eight-day period. Section 2. As provided in Article V of these bylaws, immediately following the election of Precinct and At-Large representatives to the County Committee, those newly elected members and lifetime members shall organize the District Committee, including the election of District officers. Section 3. As provided in the State Party Plan and Article IV of these Bylaws, the newly elected members of the County Committee shall meet within 40 days of the precinct caucuses to reorganize and elect officers of the County Committee. Section 4. For the purpose of transition, exceptions to the foregoing Sections of this Article are provided in Article IV. (a) The County Committee shall consist of those members elected by the Democratic voters of Fairfax County at the reorganization caucuses, and those members elected by the County Committee itself to fill vacancies which occur subsequent to such election by voters. (b) The following individuals shall be voting ex officio members of the County Committee upon signing a filing form and paying the filing fee: Democratic elected officials, including officials in non-partisan office who are endorsed by the Democratic Party, holding office in, or from, Virginia who reside in Fairfax County; elected members of the Democratic National Committee who reside in Fairfax County; members of the Virginia State Central Committee who are not otherwise members of the County Committee; Democratic members of the Electoral Board, and, if a Democrat, the Office of Elections General, Registrar; immediate past Chairs of the County Committee and each District Committee who reside in Fairfax County; any former Democratic member of the Virginia General Assembly and any former Democratic Supervisor or Democratic Constitutional Officer elected in the Commonwealth of Virginia who resides in Fairfax County and is currently a Democrat. (c) Any former Virginia Governor who is a Democrat and resides in Fairfax County shall be a life time honorary member of the County Committee and shall be a voting member upon signing a filing form and paying the filing fee. (e) Persons who have given long-term, exceptional service to the County Committee may be elected as honorary lifetime members; these shall be known as the Mary Anne and Jack Hurt Memberships, or Life Members. There shall be no filing fee for lifetime memberships, but they shall be voting members if they reside in Fairfax County and upon signing a filing form. (f) Up to four persons per Supervisor District who have been members of the County Committee for at least 20 years or elected officials who have represented Fairfax County for at least 10 years may be elected at the District reorganization caucuses as Emeritus Members. Payment of the filing fees for Emeritus Members shall be optional, but they shall be voting members if they reside in Fairfax County and upon signing a filing form. Section 2. When the County Committee is to be reconstituted by the Democratic voters of Fairfax County, the existing County Committee shall determine, by resolution at its September meeting, the time, place and manner of such election, the basis of representation of each precinct and district, and the time, place and manner of filing declarations of candidacy for election to the County Committee. As provided in the State Party Plan, the precinct and district meetings for this purpose shall be held on or between the first and second Saturday in December of each odd numbered year. The County Chair shall cause ample notice of all these actions to encourage maximum participation of Democratic voters. Section 3. Each precinct shall be represented by the number of members apportioned in accordance with Article II, Section 2. One of the seats apportioned to each precinct shall be reserved for a member who is a resident of that precinct at the time of his or her election. If no such resident seeks election to the County Committee, one seat in that precinct shall remain vacant until such a person is available. Section 4. Declarations of candidacy for election to the County Committee shall be accompanied by a filing fee in an amount fixed by the County Committee; fees shall be waived for any Democrat who signs a statement of inability to pay. Section 1. At the reorganization meeting, the members of the County Committee shall elect the following officers: Chair, referred to in these Bylaws as the “County Chair;” Vice Chair South; Vice Chair Central; Vice Chair North; Vice Chair for Precinct Operations; Vice Chair for Technology; Vice Chair for Voter Registration and Education; Vice Chair for Finance; Vice Chair for Outreach; Corresponding Secretary; Recording Secretary; Treasurer; and Assistant Treasurer. Such elections shall be by secret ballot except when a candidate is unopposed. Section 2. The Vice Chairs South, Central and North shall be referred to as the “Regional Vice Chairs”. The Vice Chair South shall reside in Lee, Mount Vernon or Springfield District. The Vice Chair Central shall reside in Braddock, Mason or Providence District. 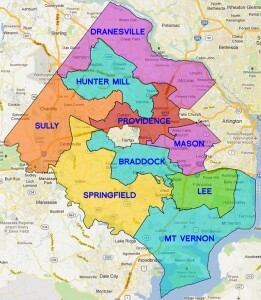 The Vice Chair North shall reside in Dranesville, Hunter Mill or Sully District. Section 3. The Regional Vice Chair who resides in the same region as the County Chair shall be the third ranking Vice Chair; the other two Regional Vice Chairs shall each be the first ranking Vice Chair for one year during the biennium, the three Regional Vice Chairs to determine in which order. The highest regional Vice Chair available shall preside in the absence of the County Chair. Section 4. The Vice Chair for Technology shall be the Chair of the Technology Committee; the Vice Chair for Voter Registration and Education shall be the Chair of the Voter Registration Committee; the Vice Chair for Finance shall be the Chair of the Finance Committee; and, the Vice Chair of Precinct Operations shall be the Chair of the Precinct Operations Committee. Section 5. The Vice Chairs, South, Central and North, shall coordinate Joint Campaign activities in Fairfax County. Section 6. Vacancies in any of the above offices shall be filled by election at the next County Committee meeting. When a vacancy in the County Chair occurs in the three-month period prior to a general election, the ranking Vice Chair, shall assume the duties of the County Chair and the election of the County Chair shall be postponed until the first County Committee meeting subsequent to the general election, except in the year of the County Committee’s reorganization, when it shall be held at the January reorganization meeting. Section 7. No person may hold office on the County Committee who is not a member of the County Committee or who does not reside within the political boundaries which the County Committee serves. Any officer who ceases to reside in Fairfax County or to be a member of the County Committee shall forfeit office. Section 8. During the period following the last regular meeting in each biennium, all outgoing officers of the County Committee and District Committees, and officers and members of standing committees shall continue to serve until they have been replaced in the manner provided in the Bylaws. Section 9. The County Chair shall be the chief executive officer of the County Committee. The County Chair shall have the authority to suspend any elected officer or Standing Committee Chair for neglect of duty for a period not to exceed 65 days. Section 10. The County Committee may remove an elected officer for cause by the following procedure. The County Chair or ranking Vice Chair may offer a motion to remove an elected officer. The motion shall be considered by the Steering Committee. If two-thirds of the Steering Committee members present and voting concur, the motion will be presented to the County Committee. If a majority of members present and voting at the County Committee meeting concur the officer will be removed. At least ten days notice shall be given to the officer prior to either the Steering Committee or County Committee consideration and such officer will have an opportunity to be heard prior to any action by the Steering Committee or County Committee. Any action by the County Committee removing an officer may be appealed to the Congressional District Committees pursuant to the State Party Plan. Section 11. The Steering Committee shall prepare a document describing the authority and responsibilities of the elected officers and Standing committees. This document, with such changes as the Steering Committee deems necessary, shall be presented to each subsequent reorganization meeting of the County Committee for consideration as an administrative resolution which may be adopted prior to the election of officers, except the County Chair. Section 1. 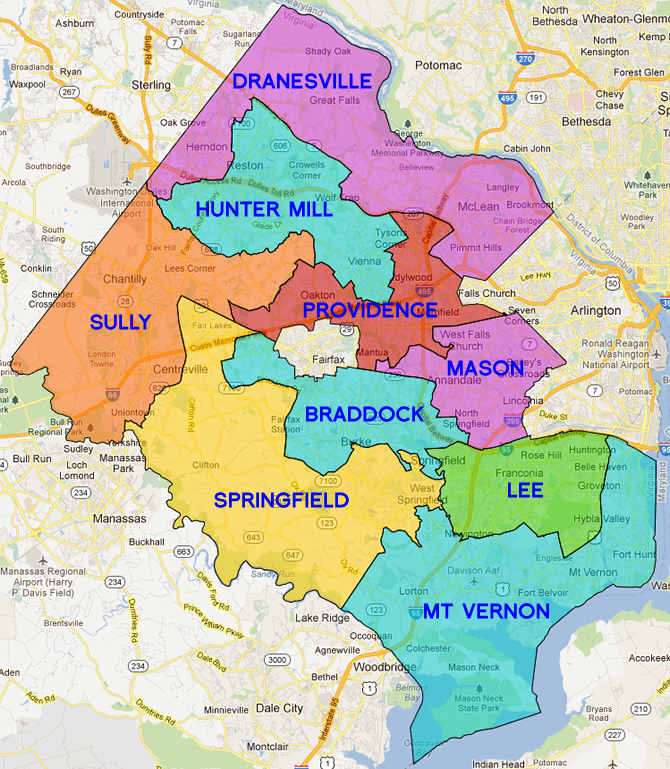 The members of the County Committee who reside in each Supervisor District of Fairfax County shall constitute the District Committee for that district. Section 2. The members of each District Committee shall elect a Chair, a Secretary, and such other officers as they see fit, and may adopt bylaws consistent with these Bylaws and the State Party Plan. Section 3. The District Committee may remove an elected District officer for cause by the following procedure. The District Chair or ranking Vice Chair may offer a motion to remove an elected officer. The motion shall be considered by the District Committee at the next regularly scheduled District Committee Meeting. If a majority of members present and voting at the District Committee meeting concur, the officer will be removed. At least ten days notice shall be given to the officer and District Committee members prior to the District Committee consideration and such officer will have an opportunity to be heard to any action by the District Committee removing an officer may be appealed to the County Committee. Section 1. There shall be a Steering Committee of the County Committee to coordinate the work of the County Committee, District committees, and the Standing committees. Section 2. The Steering Committee shall consist of: the elected officers of the County Committee, the chairs of the district committees, the chairs of the standing committees, a representative selected by the Advisory Committee, the highest ranking officer of the Eighth, Tenth and Eleventh Congressional District Democratic Committees who are members of the County Committee, a representative selected by the Fairfax County Young Democrats who is a resident of Fairfax County; the immediate past County Chair, and any member of the State Central Committee’s Steering Committee who resides in Fairfax County and is a member of the County Committee. If an officer of the County Committee who chairs a Standing committee or a District chair is unable to attend a meeting of the Steering Committee, they may designate another officer of their committee to represent that committee with full privileges; if a chair of a Standing committee is unable to attend a meeting of the Steering Committee, they may designate another member of their committee to represent that committee with full privileges. The County Chair shall be the Chair of the Steering Committee. Section 3. When situations arise in which a policy decision of the County Committee would normally be required, but cannot be achieved in a timely fashion, powers of the County Committee shall vest in the Steering Committee. In such situations, all members of the Steering Committee shall have the right to speak but only the elected officers of the County Committee and the chairs of the District committees may vote. Section 4. The Steering Committee; may not amend the Bylaws; may not authorize new expenditures which equal more than 5% of the annual budget of the County Committee; may not elect members to the County Committee; may not elect or remove officers of the County Committee; may not endorse candidates for nonpartisan elections; may not determine the apportionment or procedures for the reorganization of the County Committee; may not nominate candidates for public office for general elections or determine the method of nominating candidates for public office for general election except in cases in which a nominated candidate dies, refuses candidacy, withdraws or if the nomination is set aside for any reason. Section 5. If the County Committee has been unable to take action on determining the method and procedure for nominations of a Democratic Party candidate for a special election and the filing date is on or before two weeks after the next scheduled FCDC meeting, the Steering Committee must meet in order to determine the method and procedures for nominating a candidate. Section 6. The Steering Committee may not approve resolutions on issues of public policy except by a three-fourths absolute vote of the members eligible to vote. Section 7. All actions taken by the Steering Committee in lieu of the County Committee shall be published electronically or otherwise made available, shall be transmitted to the members, and shall be discussed at the next meeting of the County Committee, and, unless legal requirements preclude it, may be reversed or amended by the County Committee. Section 8. Meetings of the Steering Committee to take actions described in Sections 4, 5, and 6 shall be convened as needed. Meetings may be called by the County Chair or any five of its members. All members must be notified of any meeting. If necessary, such meetings may occur as soon as possible after they are called. Section 1. There shall be the following standing committees: The Democrat, Education, Diversity, Election Law and Voter Protection, Finance, Headquarters, Labor, National Affairs, Personnel, Precinct Operations, Senior Citizen Affairs, State and Local Affairs, Technology, Voter Registration and Education, Women’s Rights, Youth Affairs, Central Communications, LGBTQA, and Veterans and Military Families. Section 2. On each Standing committee other than Election Law and Voter Protection, Personnel, and Precinct Operations, each District committee may have more than one member, but shall be entitled to one vote. The vote for each District may be established as a priority among members or as fractional, the determination to be made in order by (a) the relevant District committee, (b) the members on the Standing committee from the district, or (c) the other members of the Standing committee. Section 3. The Precinct Operations Committees shall have one voting member for every thirty County Committee members or major fraction thereof apportioned to each district committee; but no District shall have fewer than two members. Section 4. The Election Law and Voter Protection Committee shall have one member, who shall be an attorney, appointed by each of the District Chairs, and one member appointed by each of the Regional Vice Chairs. The Chair of the Election Law and Protection Committee shall be appointed by the County Chair and shall be an attorney. Section 5. The Personnel Committee shall be appointed by the County Chair, and the County Chair, the Treasurer, at least one Regional Vice Chair, and at least one District Committee Chair, shall be members. Section 6. A Standing committee shall meet at the call of the chair or upon the request of any five of its members. Section 7. The Treasurer and Assistant Treasurer shall be members of the Finance Committee. Section 8. The Webmaster and VAN Administrator shall be members of the Technology Committee. Section 9. A convener of the reorganization meeting of each Standing committee shall be designated by the County Chair. The members of each Standing committee shall elect a chair from themselves, except as provided elsewhere in these Bylaws. Section 11. The County Chair shall be an ex officio, nonvoting member of all Standing committees; but the attendance of the County Chair shall not be considered for purposes of a quorum. Section 12. The County Committee may establish special committees. The purpose of a special committee and the method of election or appointment of its members and the method of selection of its chair shall be expressed in the resolution of the County Committee by which the special committee is established. Section 13. The County Chair may establish task forces and appoint their members and chair for a limited purpose to be concluded within 90 days. If the work of a task force cannot be concluded within 90 days, the County Committee may establish a special committee for the purpose. Section 14. The County Chair may convene a meeting of any standing or special committee. Section 15. The Democratic elected officials shall constitute an Advisory Committee. The Advisory Committee shall elect a chair and Steering Committee from among themselves. Section 16. The County Chair shall appoint a Parliamentarian and a Counsel, who shall advise the County Chair and the Steering Committee but shall not serve as members of the Steering Committee in these roles. Section 17. The County Chair may appoint a Webmaster, VAN Administrator, and a Communications Adviser, to assist with these stated jobs and advise the Chair, Steering Committee, and District committees, but shall not serve as members of the Steering Committee in these roles. Section 1. As provided in the State Party Plan, after the biennial election of the complete membership of the County Committee in district caucuses, the County Chair of the outgoing County Committee shall within 40 days convene a reorganization meeting, the agenda to include the election of officers. Section 2. The County Committee shall hold its regular meetings on the fourth Tuesday of January and the fourth Tuesday of each alternate month thereafter. When the date of a meeting of the County Committee falls on the day of an election in Fairfax County, the meeting shall be held on the following day. The regular meeting date of a County Committee meeting may be changed by the County Committee or the Steering Committee, provided that notice is sent to all members. Section 3. Special meetings of the County Committee may be held upon the call of the County Chair or upon receipt by the County Chair of a written request signed by at least 10% of the members of the County Committee. At least 3 days notice of the time and place shall be given of any special meeting. Section 4. The Steering Committee shall meet on the second Tuesday in January and the second Tuesday of each month thereafter. The Steering Committee may meet as called by the County Chair, or as elsewhere provided in these Bylaws. When the date of a meeting of the Steering Committee falls on the day of an election in Fairfax County, or on the date of the January Reorganization meeting of the County committee, the meeting shall be held on the following day. Section 5. When meetings of the County Committee or Steering Committee cannot be held on the regular dates, the County Chair shall reschedule the meetings and notify the appropriate members. Section 6. Each District committee and Standing committee shall have a regularly scheduled meeting date. Notice of all District committee and Standing committee meetings shall be sent to all members of the pertinent committee. Section 7. The presence of 30% of the members of the County Committee and each of its committees shall constitute a quorum for the conduct of business. Section 8. The use of proxies at any meeting is prohibited. (b) the Steering Committee may decide, by a two-thirds vote of present members to meet in closed session provided that the nature or the issues discussed is made public. Section 1. Written or electronic notice shall comply with the requirement in the State Party Plan for seven-day notice of meetings of the County Committee. Notice of all meetings of the County Committee, including the agenda, shall be sent to all members. Section 2. Electronic means of communication may serve as prior notice for all meetings, provided that an adequate combination of means shall be used to assure that all members of the pertinent committee receive the notice. Section 3. A meeting of the County Committee may be called by the County Chair with as little as two days notice for the purpose of determining the appropriate procedures for nominating candidates for Fairfax County Special Election. Section 1. The right of a member of the County Committee to introduce resolutions at a meeting shall not be abridged. Members shall make every effort to submit proposed resolutions to the Steering Committee prior to consideration by the County Committee. Section 2. All resolutions calling for the expenditure of money by the County Committee shall be submitted to the Steering Committee before consideration by the County Committee, except in the case of an emergency as determined by a two-thirds vote of those members of the County Committee present and voting. Section 3. All resolutions that are transmitted to members, published electronically or otherwise made available to members seven days prior to consideration at a meeting of the County Committee may be adopted by a majority of the County Committee members present and voting. All other resolutions may be adopted by a two-thirds vote of the members of the County Committee present and voting. Section 4. In addition to consideration of resolutions offered, the County Chair may, at the request of any individual member, make available on the agenda up to ten minutes for general discussion of any policy or issues. Section 5. For endorsement of candidates for non-partisan office within a Supervisor District, the District Committee shall consider the candidates and recommend no more than one to the County Committee. For endorsement of candidates for non-partisan offices larger than one Supervisor District, the County Committee shall consider the candidates. Recommendations for endorsement must be approved by the County Committee. The County Committee may choose not to endorse. Section 1. The County Chair shall present a draft budget to the County Committee for review, at its regularly scheduled meeting on the fourth Tuesday of January of each year. Section 2. The Steering Committee shall review the draft budget at its January, February and March meetings and make amendments as it deems necessary. Section 3. The amended budget shall be presented to the County Committee for consideration at its regularly scheduled meeting on the fourth Tuesday of March of each year. Section 1. Where not inconsistent with these Bylaws or with the Virginia Democratic Party Plan, Robert’s Rules of Order, Newly Revised, shall govern the conduct of business of the County Committee and its committees. Section 1. Each member of the County Committee shall be notified, at the expense of the County Committee, of proposed amendments to, or revisions of, the Bylaws. Such notice shall be written or electronic and sent at least seven days prior to each meeting at which the amendments are to be considered. Section 2. The Bylaws may be amended by a two-thirds vote of the members present and voting at the biennial reorganization meeting of the County Committee. Amendments to the Bylaws considered at the reorganization meeting may not be amended from the copy distributed to the members prior to the meeting. Section 3. The Bylaws may be amended by a majority vote of the members present and voting at two consecutive regular meetings of the County Committee within a biennium. Except to delete provisions which do not alter the effect of other provisions, proposed amendments to the Bylaws may not be amended at the second of the consecutive regular meetings without requiring passage in the amended form at the next regular meeting.